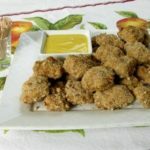 A recipe for easy homemade baked chicken nuggets with a pecan crust and a honey mustard dipping sauce. Preheat the oven to 375 degrees F. Place a cooling rack in a baking sheet and set aside. Use three shallow containers. Place the flour in one, eggs in another, and pecans/breadcrumbs mixed together in the third one. Cut the chicken tenderloins into four pieces each (will be about 1-inch chunks). Season the chicken with salt and pepper. Dip each chicken piece into the flour and shake off the excess. Dip each one in the egg mixture and then dredge into pecan/breadcrumb mixture to coat all over. Shake off the excess and place coated pieces on the rack in the baking sheet. Bake for 15 to 20 minutes until the chicken is cooked through and the crust is golden. Serve warm with honey mustard dipping sauce. In a bowl, stir or whisk together the mayonnaise, mustard, honey, and cider vinegar until smooth.